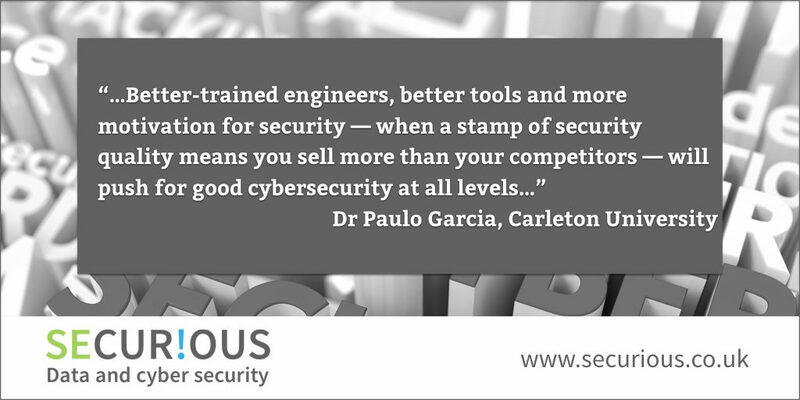 Dr Paulo Garcia from Carleton University in Canada discusses in The Conversation the three reasons why hardware is inherently unsafe and how, with the rise of the Internet of Things, a stamp of security will provide a competitive edge. The named tech firms have denied this report; at the moment, we have no way of knowing who is right. If true, this is potentially the greatest malicious hardware security breach we’ve seen. If not true, well… there are still enough hardware security vulnerabilities to go around. But this doesn’t affect you directly, apart from a slightly slower computer… or does it? Perhaps an Amazon Echo or another smart speaker? An electronic doorbell or intercom? Your car alone, if less than ten years old, has dozens of processors responsible for everything from controlling the radio to acting on the brakes. A Spectre/Meltdown-like bug on your car’s breaks is a frightening thought. This is much easier to detect and correct than a security vulnerability, which is often incredibly nuanced — those interested in reading more about the Spectre/Meltdown exploit will see it’s a very, very sophisticated attack. Last year, a cybersecurity researcher found several undocumented instructions on an Intel i7 processor. Instructions are the atomic operations a processor can perform: for example, adding two numbers, or moving data from one place to another. Every program you run likely executes thousands or millions of instructions. The discovered ones are not disclosed on the official manual, and for some, their exact behaviour remains unclear. Unlike in software, these weak points have long lasting effects and are not easily corrected. Many researchers are contributing to solve these problems: from techniques for verifying that designs match specifications, to automated tools that analyze interactions across components and validate behaviour. In safety-critical real time systems (think autonomous cars, aeroplanes, etc. ), where how long something takes to execute is critical. This has been a problem for a while. Current processors are designed to execute as quickly as possible most of the time, and will occasionally take lengthy periods; predicting how long something will take is incredibly challenging. We do know how to design predictable processors, but virtually none are commercially available. There’s little money to be made. In the long term, the same won’t hold true for security. As the age of the Internet of Things dawns on us, and the number of processors per household, vehicle and among infrastructure continues to increase, companies will undoubtedly move towards security-conscious hardware. Better-trained engineers, better tools and more motivation for security — when a stamp of security quality means you sell more than your competitors — will push for good cybersecurity at all levels.